Increasingly, whenever anyone tries to talk about political or economic facts, no one listens, because it is assumed that all “facts” are really opinions and that the evidence in inconclusive, with an equal amount of distortion by all sides and parties involved. However, the result of this kind of thinking is that it becomes absolutely impossible to inform people, because any factual evidence that contradicts a person’s preferred position will be assumed away as “media bias”. The key thing to notice here is that Romney is promising a 20% cut in marginal rates–that’s a lot of revenue lost, and Romney wants to close the deficit, so Romney has also promised to make his tax plan “revenue neutral”. This means that the 20% cut in marginal rates (as well as his other, smaller tax reductions) has to be made up by other policies that recover the lost revenue. Romney claims he can do this by closing loopholes in the tax code that allow various revenue to be lost through tax deductions–this is called “base broadening”. 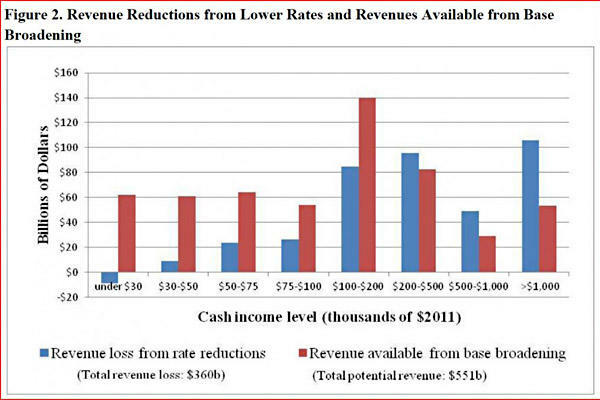 Our major conclusion is that any revenue-neutral individual income tax change that incorporates the features Governor Romney has proposed would provide large tax cuts to high-income households, and increase the tax burdens on middle- and/or lower-income taxpayers. This means that even if tax expenditures are eliminated in a way designed to make the resulting tax system as progressive as possible, there would still be a shift in the tax burden of roughly $86 billion from those making over $200,000 to those making less than that amount. The plan lowers taxes on the top 5%, while raising it for the remaining 95%. An annual family income of $200,000 seems to be the dividing line–those under it would see a 1.8% fall in their after tax income, while those with children under it would see a 3.5% fall (many of the loopholes closed to make it work would necessarily impact tax deductions on people with dependants). This report has been met with glee on the left, with many pundits and media sources talking it up, but it has not resulted in a substantial move in the polls numbers between Romney and Obama, in which Obama has maintained more or less a 2-point lead. The 45% who consistently poll for Romney either recognise that most of them will see higher taxes under Romney and accept that policy as beneficial, or they deny the validity of the Tax Policy Centre’s report, calling it another example of “media bias”. I suspect that the vast majority fall into the latter category. On what grounds is the Tax Policy Centre accused of bias? It has reached a conclusion that favours the political left, and therefore all those sympathetic to the political right assume it to be wrong somehow, that it must be messing with the data by assuming things that are not true. The Tax Policy Centre is however, an independent, non-partisan organisation, and, furthermore, a careful examination of the assumptions the centre used in its report reveal many assumptions that would seem to bias their result, if anything, in Romney’s favour–they assumed that all non-investment tax loopholes that benefited the wealthy would be closed first, for example. Reading the report, there is not a single instance in which Romney’s plan seems to get any significant bias in its treatment from the Tax Policy Centre. Those on the right who are not in the top 5% economically and who do not wish to see their taxes rise have their heads in the sand on this one. Below is a link to the Tax Policy Centre’s report. Read it. If you find bias, leave a comment on this post explaining how what the Tax Policy Centre did in its report to bias it against Romney. If you don’t find bias, I challenge you to change your view, and if you can’t, if you still support Romney’s tax policy, I want to know why–leave a comment explaining your view.